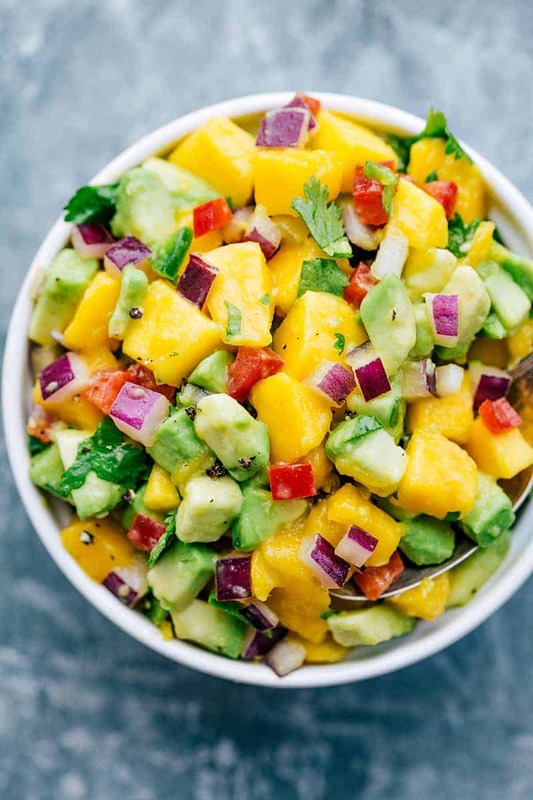 This mango salsa is our go-to recipe when mangoes are ripe and in season! This salsa is simple to make, packed with flavor and texture, and pairs well with so many dishes. It’s also a great stand-alone side dish or perfect with some tortilla chips! I love pairing this mango salsa with grilled chicken (using this popular grilled chicken marinade recipe, adding it to shrimp tacos, or serving alongside some grilled salmon. Mango salsa paired with tortilla chips is one of my favorite healthy snacks. It also makes the ultimate fresh topping to grilled fish or chicken. And the best part? Definitely how easy it is to make. 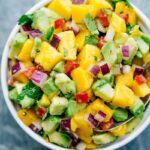 Today I’m sharing how to make mango salsa, my top tips for the best salsa, and how to use your delicious mango salsa. Making this salsa is as easy as mixing together chopped ingredients. Prep ingredients: chunk the mango, chop the avocado, dice the red pepper, red onion, & jalapeno, and coarsely chop the cilantro. Toss together and season: mix all your prepped ingredients together and season with salt, pepper, cumin (the “secret” ingredient here! ), and fresh lime juice. Serve: the mango salsa is ready to be enjoyed on its own OR use one of the ideas below to add this salsa to. Below are a few quick tips to ensure your mango salsa is tasting its best. 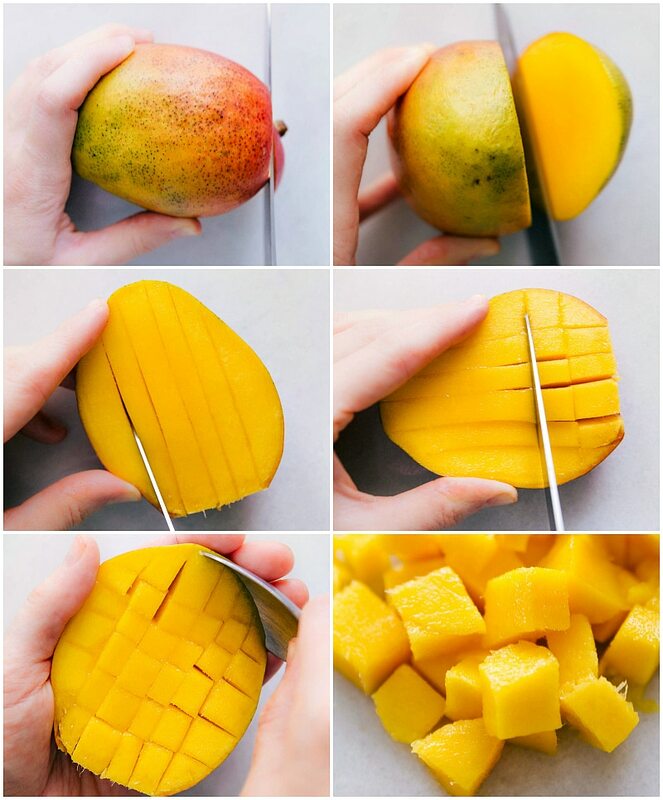 Make sure your mango and avocado are fully ripe. This ensures peak flavor and texture. Chop the ingredients into even sizes. 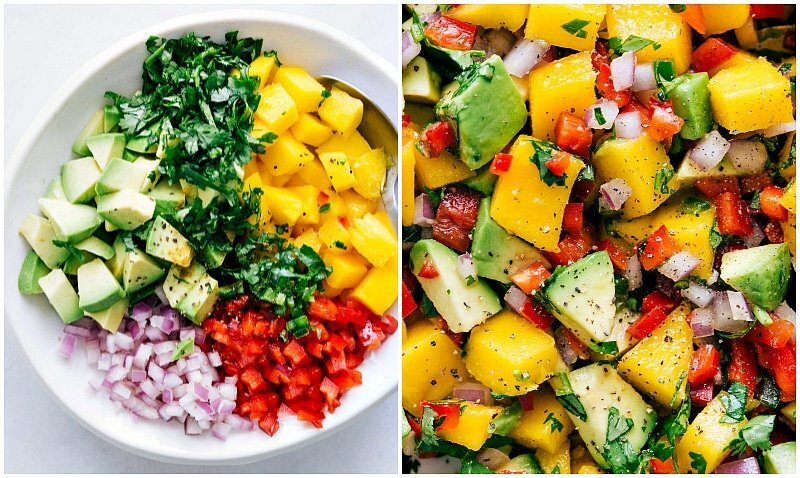 By doing so you’ll have a perfect texture and it helps keep the ingredients together into a congruent mango salsa. If you like a little more kick in your salsa, add a bit more jalapeno and cumin. 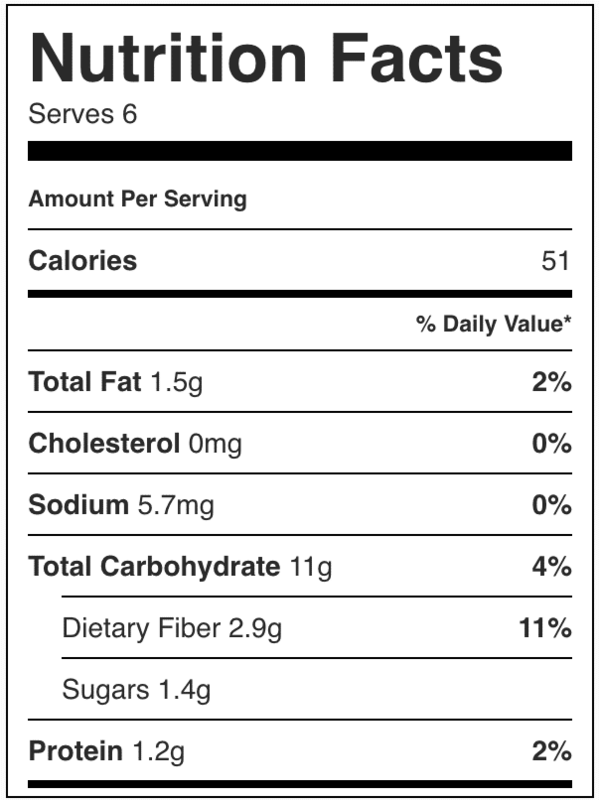 However if you prefer your salsa more mild, feel free to leave these ingredients out. Use it to top grilled meat or fish. We love grilling marinated chicken (our favorite grilled chicken recipe here) and serving it with a huge topping of this salsa. Make the salmon from this Mojo Salmon Bowls recipe and add this salsa on top. 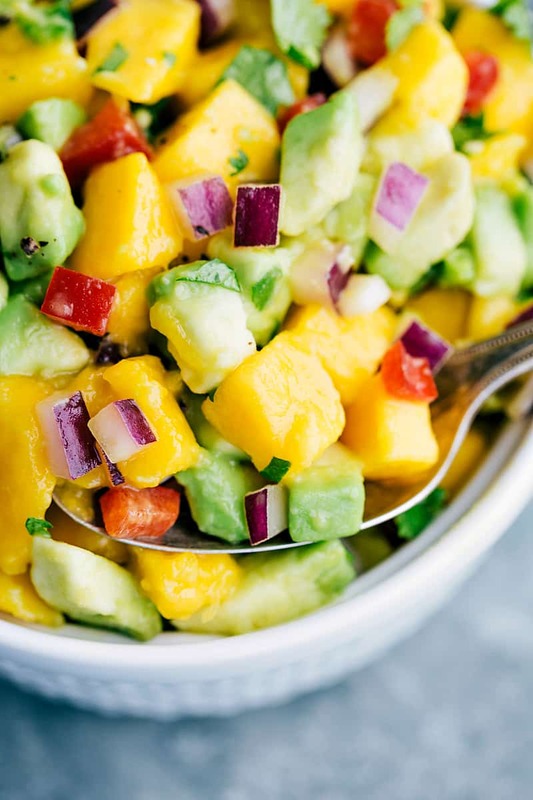 This mango salsa also makes a great side dish to a summer BBQ – you can eat it by the spoonful! However you choose to eat this salsa I hope it becomes one of your favorites! How do I store this mango salsa? Because of the avocado, this salsa doesn’t store well. 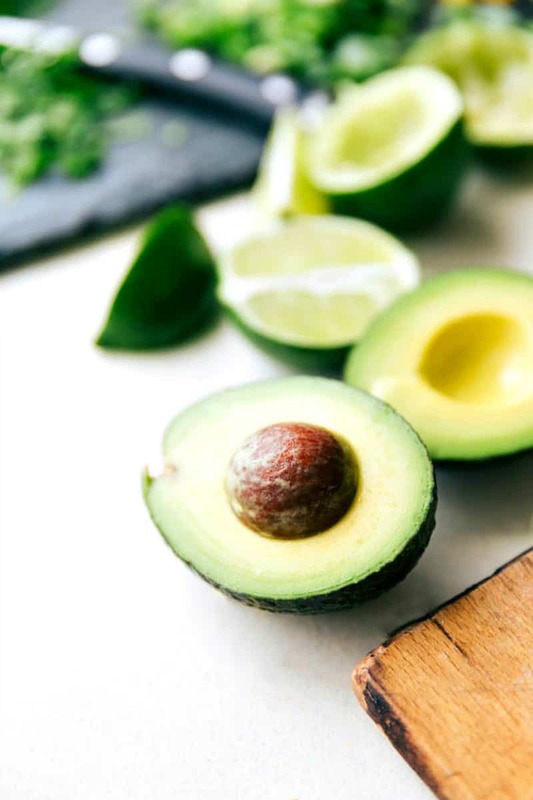 Although the lime juice should help slow down how quickly the avocado turns brown, it is still not as good after being stored. If you do have leftovers, place them in an airtight container in the fridge and store for up to 1-2 days. Combine the mango, avocado, red pepper, jalapeño, red onion, lime juice and cilantro leaves and mix well. Season with salt and pepper to taste (and cumin if desired). That salsa! I loveeee anything with mango! I would put that on just about everything!